I found this recipe in a very average cooking book, with other kinds of ingredients. Because I thought that this dish had a great potential, I changed to healthier and lighter ingredients and the results are delicious, fresh and super healthy! Take the inner part of the zucchinis with a small spoon and make sure to cut them in small pieces, and reserve. Cook the zucchini shells in damp until “al dente”. Pass them in cold water to stop the cooking process like pasta. Cut the chicken in small dices and reserve. In a pan braise the garlic and the shallot, add the chicken and braise until gold, add the reserved zucchini and the tomato. Add a little bit of salt and pepper if you wish. Cook until the zucchini is ready. 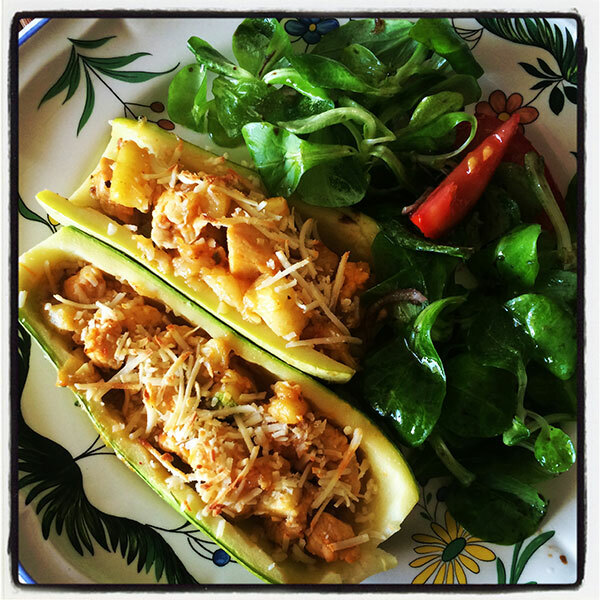 Fill the zucchini shell with the chicken and put in the oven with parmesan cheese on top of it for 5 mins. (I can’t live without).